The opposition coalition is championing an ‘interim justice’, which is only a temporary solution to the nation’s problems, says incumbent President Abdulla Yameen Abdul Gayoom. 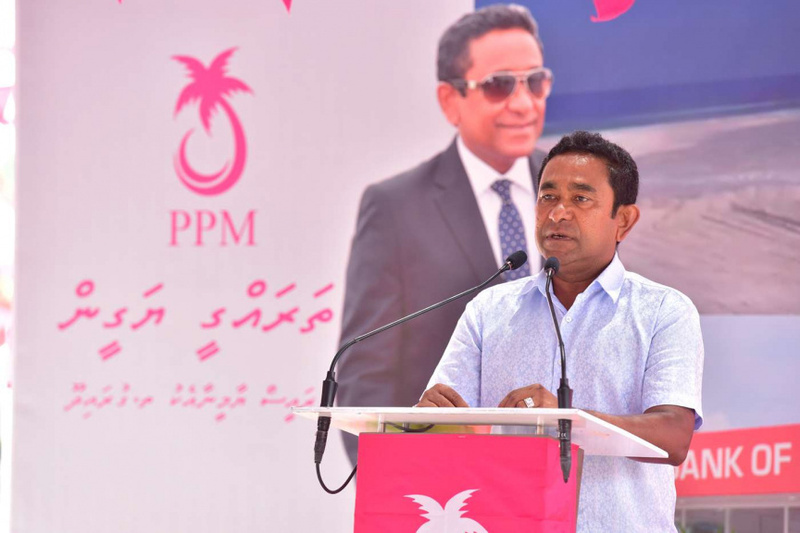 Speaking at the campaign event held by Progressive Party of Maldives (PPM) in R. Dhuvaafaru last Monday night, Yameen asked his presidential rival MP Ibrahim Mohamed Solih (Ibu) what the opposition meant by an ‘interim justice’. “The term interim doesn’t mean permanent. ‘Interim’ is associated with something temporary. So their interim justice will be a temporary justice. It’s only a temporary solution. The solution needs to be good, and it needs to be permanent,” said Yameen. The President said that justice is established based on judgements passed by the Supreme Court and lower courts, and that he does not believe the courts will rule in favor of a temporary arrangement. Yameen made the comments in challenge to the statement by Ibu during his recent tour of B. Atoll that if elected President, he will spend the first two years of his presidential term providing interim justice to the wrongs done by Yameen’s administration. “Our administration’s target will be to establish interim justice within the first 18 to 20 months. I will address the theft, corruption and injustice by the current administration during my first two years,” said Ibu. Yameen said in his speech that the biggest act of treason during the Maldivian Democratic Party (MDP) administration was the GMR case. He said the opposition therefore needs to first investigate the GMR case. He also said the State Asset Recovery Commission has also appraised the value of the assets lost during the previous 35 years, and that the work doesn’t need to be redone. “We need to talk in detail about the GMR transactions. And if the people elect be for a second term, I need to look into this case,” said Yameen. He said a quick look over the figures in the transactions shows how much the people have been misled. He said the Maldives Airports Company Limited (MACL) suffered a loss of approximately USD 1.2 billion due to the deal. And that the State had to spend USD 320 million more to retake the national airport. Yameen talked in detail about the losses due to the GMR case. He said the deal was a deliberate act to render the government powerless.